The 81-83 Datsun 280ZX Turbo (S130) and 84-89 Nissan 300ZX Turbo (Z31) both use Nissan’s ECCS fuel injection system. The Z31T ECU is virtually plug & play into the 280ZXT EFI harness with a few quick wiring changes. 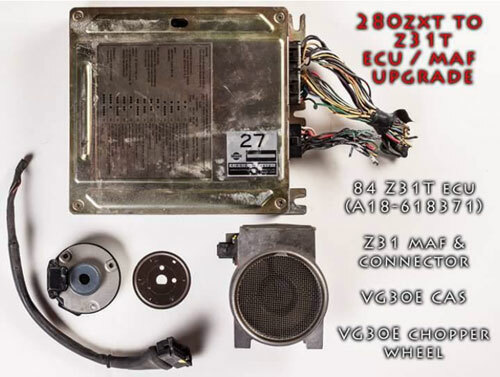 Benefits of this upgrade include: updated fuel and ignition timing control, less airflow restriction, option to use NIStune, PocketROM, JWT, AFC or similar after market programmable ECU controls, ECU diagnostic codes, wiring fixes, etc. This swap alone will only add about 10hp, but eliminates the troublesome AFM and wiring bugs of the 280ZXT. Running with a boost controller and intercooler, the Z31T ECU will really make big improvements. The Z31T had several EFI changes throughout its production that may affect your installation procedure. Details will be discussed below, but be aware of ECU high / low impedance, *o2 sensor type, and internal circuit boards. Before attempting this swap, read these steps many times to become familiar with the nomenclature. Also print out and study the wiring schematics. Insert new wire (from Z31 ECU plug) into empty pin 12 of ECU connector then cut wire 33 Y/L with several inches of wire. Attach to new pin 12. 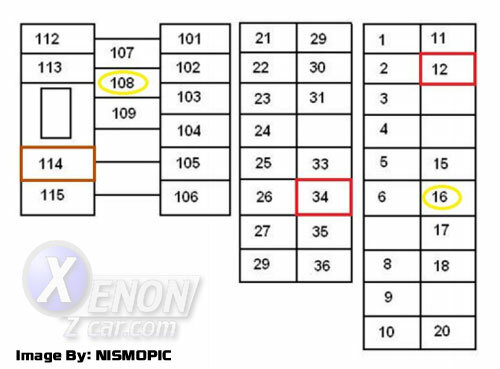 So pin 12 from the Z31 ECU thru wire 33 Y/L will be connected to the 12 R/W wire on the MAF (marked as F). Now the ECU will be able to self clean the MAF filament. Z31T ECU pin 33 is not used and can be taped off. Insert new wire (from Z31 ECU plug) into empty pin 34 of ECU connector then connect it to a new wire going to 12v switched power (27 / 35 B/W from fuel pump control module sub harness). For 81T harness, insert new wire into empty pin 114, connect to direct battery power (fused). The air regulator was controlled thru pin 108 B on the 280ZXT ECU (which controls the FPR on the Z31T ECU). Cut pins 108 B and 16 L/R coming out of the ECU connectors with several inches of wire. Connect harness side of 108 to ECU pin 16 and now the Z31T ECU will control the air regulator from ECU pin 16. Connect the remaining harness side of pin 16 L/R (12v+ power source for turning on relay) to 12v switched power (27 / 35 B/W from fuel pump control module sub harness). Remove glove box and with flashlight locate the green FPR (removing dash may be easier). Cut black wire (ground source used to turn on relay) before FPR and connect relay side of black wire to new wire. Run new wire under dash to ECU pin 108 (just cut from above step) on the ECU connector. The Z31T ECU now controls the FPR ground from ECU pin 108. Connect MAF Position A/wire 30 Y/G to 30 Y/B wire from 280ZXT harness. Connect MAF Position B/wire 31 B to 31 Y/R wire from 280ZXT harness. Connect MAF Position C/wire B to body ground. Connect MAF Position D/wire 26 B to 26 B wire from 280ZXT harness. Connect MAF Position E/wire Run new wire to 27/35 B/W (V.C.M solenoid power source located under the AFM bracket). Connect MAF Position F/wire 12 R/W (for cleaning cycle) to 33 Y/L wire from 280ZXT harness. 1. Remove distributor cap, then rotor. 2. Under the rotor is a Phillips / Flathead screw. With the appropriate screwdriver, apply pressure and remove screw. 3. Remove rotor mount, then remove 280ZXT encoder disc. 4. Install new encoder disc opposite of removal. Make sure to install with number stamp UP. 5. For 81T needing the 82-83T distributor,See the Distributor swap write-up. If you are using a 1984-1987 Z31 ECU on a 1981 S130 you will need to remove the stock Dropping resistors. They are located in the Driver side kick panel. You can either create a set of 6-to-1 spade jumpers to fit into the resistor plug, or cut out the plug entirely and connect all 7 wires together (1 hot + 6 injectors).Warning: Do not bypass resistors if using the 88-89T Z31 ECU). If you are using a 1988-1989 Z31 ECU with the Low Impedance Injectors, You will need to add dropping resistors inline to each injector. Use 6.8 ohm 10 watt resistors, offset one by one so they don't bulge the harness. The Z31T ECU does not use a FPCM, instead internally controlling the FPR ground. Remove FPCM and tape up plug / connector. 81T does not have a FPCM. The Z31T ECU does not use the same style AAC and EGR systems. You may leave the AAC and EGR actuators in place on the manifold, but they won’t function. Remove the VCM solenoid and cap any open vacuum lines. **FYI: If you remove the AAC actuator, you will need to adjust the throttle body stop screw for idle RPM’s. The Z31T ECU does not use the same signal for the detonation sensor. Disconnect and tape up wires, located on right side of block, by oil filter. there were two different types of O2 sensors used on the Z31. You will need to match the O2 Sensor to the ECU you are using. You can use the ECU lookup tool to determine the Sensor you need to use. You can either use an 18mm to 12mm adapter bung or weld in a new M12x1.25 O2 sensor bung. NGK 24007 Titania O2 sensor can be found on eBay for $12.50 shipped. Connect Black wire to ECU pin 24. Connect Red heater wire to switched 12v power. Connect White heater wire to ECU pin 115.